Queens Borough Historian Dr. Jack Eichenbaum has probably forgotten more about Queens and its history than I will ever know. 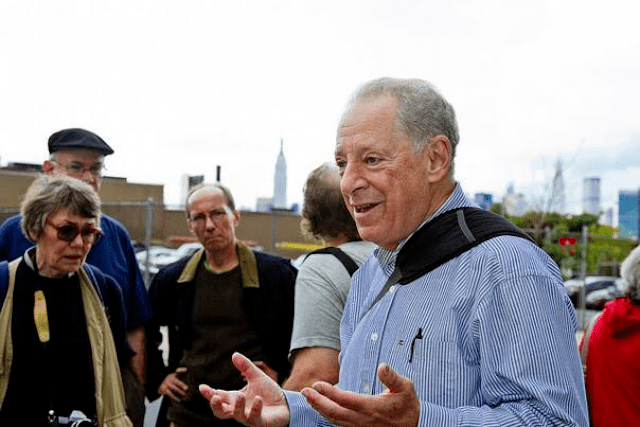 Eichenbaum holds a Ph.D. in urban geography (University of Michigan, 1972) and is a lifelong observer of New York City and other large cities around the world. He was appointed Queens Borough Historian in 2010. He leads several walking tours throughout the year, including his signature tour The New World of the Number 7 Train, which takes place Sunday April 10, from 10 a.m. to 5:30 p.m. This series of six walks and connecting rides along a major transportation corridor focuses on what the 7 train has done to—and for—surrounding neighborhoods since it began service in 1914. The tour covers Hudson Yards, the Long Island City shoreline, Flushing West, the Iron Triangle, North Corona, and Woodside-Jackson Heights. The tour fee is $45, to reserve a spot on Sunday’s tour call 718-961-8406. I’m grateful that he was able to take time out of his busy schedule to answer 7 Questions. What part of Queens do you live in and how long have you been living there? I’ve lived on historic Bowne Street in central Flushing for the last 38 years. But I was born in Flushing and grew up in Bayside for 20 years. I spent 13 years in four other states and three other countries but in New York City, I always called Queens home. What are some of your favorite things about living in your neighborhood? The trees, the convenience to various forms of public transportation, the Asian food. As you know we share love of Asian cuisines. What are some of your favorite dishes and restaurants? I love to get soup dumplings at A Taste of Shanghai or Nan Xiang Xiao Long Bao both of which are in Flushing. I also enjoy the dosai (Indian crepes) at Dosa Hutt in Flushing and Dosa Delight in Jackson Heights. Flushing is also home to Fu Run, which serves Muslim lamb chop, a spice encrusted rack of lamb. And when I am in Jackson Heights I like to get the Korean fried chicken at Unidentified Flying Chickens. What exactly do you as Queens Borough Historian? I field questions from the press and the public. I lead many walks focused on the historical geography of Queens. I write articles for the Queens Historical Society newsletter. Tell me about this Sunday’s tour? I've been leading daylong walks/rides along the Number 7 train for more than 15 years. With the new station at 34 St/Hudson Yards I have completely revised the tour. So much change has occurred recently along the route. What are some your favorite things to do in Queens? I like to walk and eat in new immigrant neighborhoods. I also enjoy experiencing nature in Queens' many parks and beaches. Downtown Flushing seems to changing and developing faster than ever. What do you think is next for that community? There are three huge malls under construction that will add to the two already here. The overwhelmingly Asian majority that has characterized Flushing in the last 20 years will likely be diluted by other immigrants and domestic migrants as housing costs in Western Queens continue to spiral upwards.